Gone are the days of stark white cabinets and beige-y countertops. 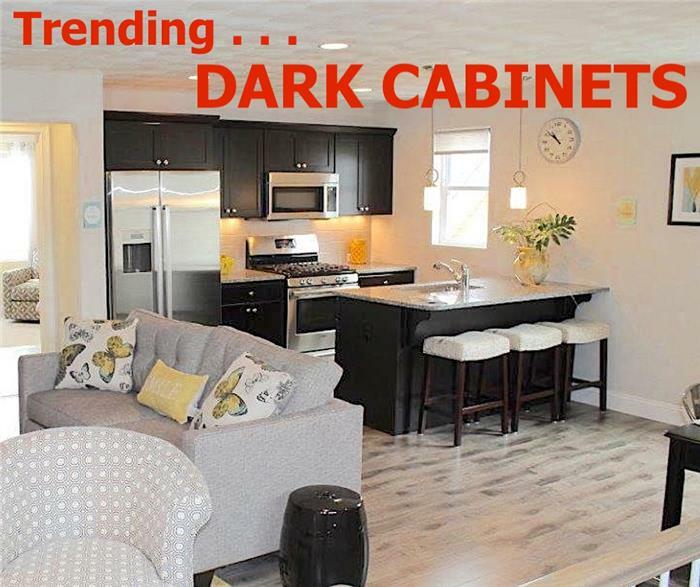 Rather than cabinets that look fresh out of a home magazine (complete with the daisies on the countertop), homebuilders are instead opting for a bold new look: dark cabinets. And we're not talking about a light gray, either. 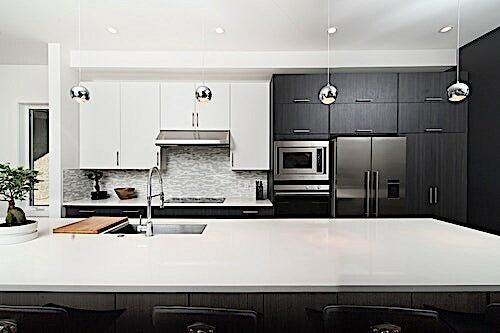 We're talking midnight black kitchen cabinets – the ones that stand in clear yin/yang fashion to their white countertops, acting as a stabilizing force in the kitchen. Or the deep-gray cabinets that add an icy, modern coolness to the heart of the home. Complete with pops of bright dishes and greenery on shale-colored countertops. We're talking about peeling off the polite crispness of last year's kitchens, and replacing them with the daring soul of the house. 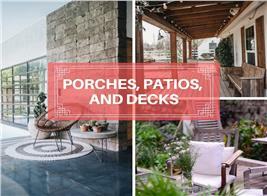 The bold accents and intriguing monochromatic color schemes. If you're in the mood to go bold with your kitchen but need a little extra nudge to do it, here are our top 5 reasons to go dark in the kitchen. These dark kitchen cabinets contrast well with the counterops and white upper cabinets over the cooktop to provide a very modern yet balanced design in the kitchen (photo credit: Jose Soriano on Unsplash). While white kitchen cabinets appear as fresh and clean as the day they were made on your TV screen, the truth of the matter (as anyone with kids or pets can attest to) is that they show dirt like nobody's business. That spattered ragu now has a permanent position of honor on your upper cabinet unless you spend your time in between meals regularly scrubbing. Unless you decide to go dark. Take the nutmeg cabinets of the kitchen below, for example. The knotted wood surface of the kitchen cabinets and the color of the wood not only easily covers dirt and blemishes, it adds a lived-in feel that lighter kitchen cabinets lacks. 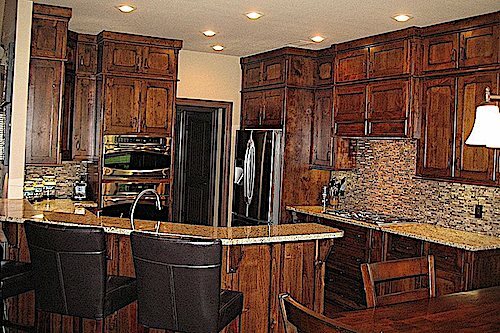 These cabinets in the kitchen of a 4-bedroom, 4.5-bath Western rustic home not only make a bold design statement but hide imperfections and light damage becuse of the variegated nature of the finish (Plan #161-1049). Dark cabinets are the bold accent many homes need. 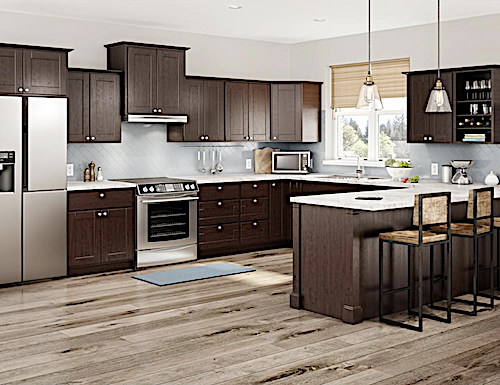 Whether it's only the bottom cabinets, an accent bar, or the entire set of kitchen cabinets, dark cabinets instantly add a chic, stylistic look to your home. For an added moodiness in your kitchen, contrast the black or gray kitchen cabinets with a lighter back splash and metallic hardware. Not only does this contrast lighten the room, but it gives it an alive, sophisticated feel. 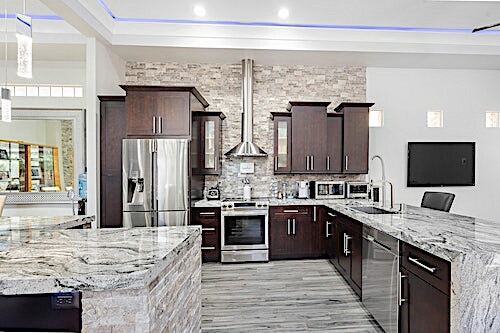 Combining dark brown cabinets with light countertops and backspash prevents the kitchen from becoming dark and oppressive and gives a crisp, modern feel to the decor (photo credit: Carl GARTMAN on Unsplash). 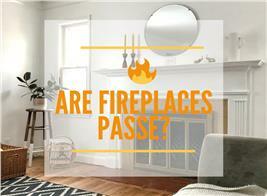 Does your living room sort of melt into your kitchen? 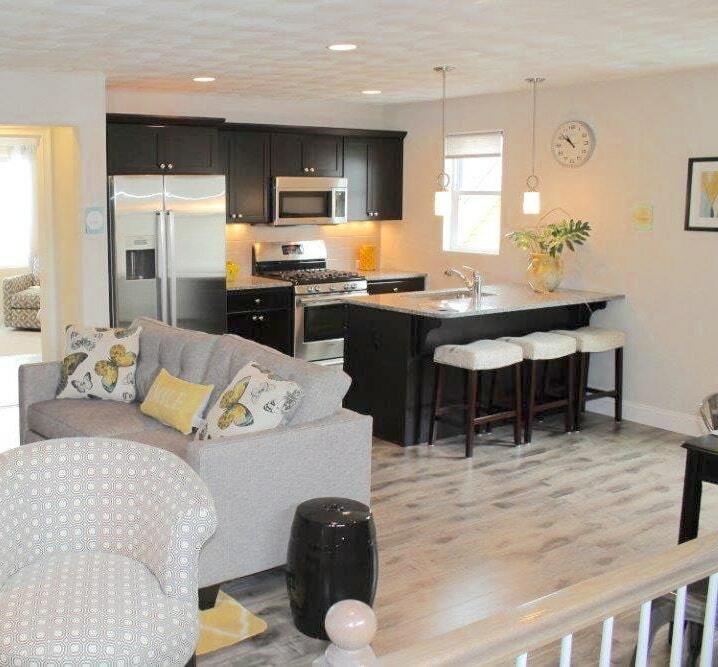 This open floor plan is a wonderful way to enjoy guests and make smaller spaces larger. However, in an effort to keep it feeling open, many use the same neutral colors throughout. 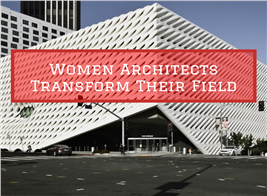 You don't really want the open floor plan to turn into a "one room house," so you look to other options. Rather than divvy up rooms with walls, though, you can still keep the defined room space without barriers by adding dark kitchen cabinets. While open to the light and airy living space in this open floor plan of a 4-bedroom, 3.5-bath Craftsman-influenced home, the kitchen is clearly defined by the contrast in colors (Plan #120-2579). Want to add a chic and modern feel to your kitchen cabinets? 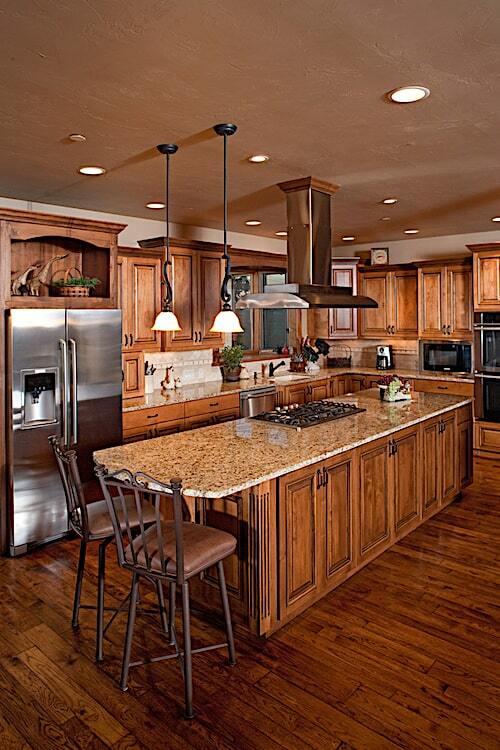 Use dark kitchen cabinets. Take the kitchen below in a 2,597-square-foot Craftsman home, for example: the dark island and range hood act as accents to draw the eye up to the vaulted ceilings and make the room feel more like an upscale restaurant than a home kitchen. However, black kitchen cabinets don't have to just be an accent to feel as though you should hire a chef instead of cooking in your sweats. The owner of this kitchen in a 3-bedroom, 2.5-bath home use both light (in the back-wall cabinets) and dark cabinets (in the island and eye-popping range hood) to create an upscale effect (Plan #142-1168). In the kitchen below, the dark-latte-colored cabinets add just the right amount of elegance that it feels a bit as if you were transported to Paris. The hanging lanterns, stainless steel appliances, and caramel-speckled granite countertops also add an upscale feel to the space. This 3-bedroom. 2.5-bath European style home's dark kitchen cabinets add height and depth to the space, and carefully placed lighting adds just the right amount of contrast (Plan# 153-2019). While brightly colored kitchen cabinets feel light and airy, they may not embody your and your family's personality or the feeling you want your your mealtimes to reflect. Dark cabinets feel moody and mysterious, but most of all—they feel homey. Those rich browns, shiny blacks, and misty grays add depth and emotion to what is often known as "the heart of the home." Espresso cabinets with geometric brushed nickel pulls and lightly speckled white marble countertops give small kitchens a modern-yet-sturdy feel. They anchor the home (especially when contrasted with subway tile or a similarly light backsplash) and naturally draw people to gather around the island. Then there are the black no-nonsense bottom cabinets with lighter top or island cabinets and a light-colored quartz, mable, or granite wraparound counter. The contrast in all of these colors instantly updates the space and adds just the right amount of light. 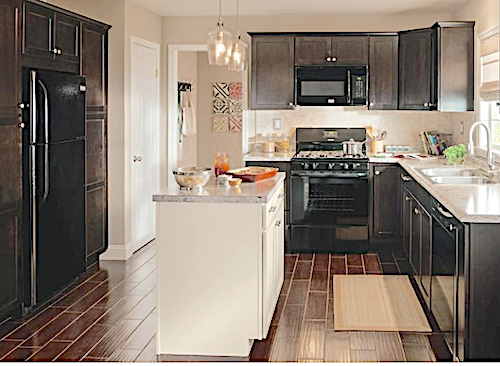 Black base cabinets and white island cabinets, along with a light background "canvas" paints a warm picture of contrasts that makes a cozy yet modern design statement (photo source: Lowes). Contrary to the whole good vs. bad logic that often comes with dark and light, there is no "right" tone to have in your kitchen cabinets. After years of clean white cabinetry, however, it seems as though homeowners are looking toward darker, bolder, and more sultry colors to add mood, style, and luxury to their space. The good part about dark kitchen cabinets is that they can still get paired with lighter counterparts to add a light and airy feel without taking away the dramatic and anchoring mood they add to any kitchen. 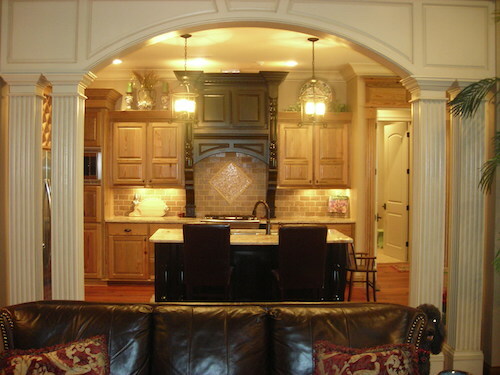 If you're looking for a way to spice up your kitchen and add depth to that corner of your home, dark-wood or black kitchen cabinets may be just the ticket for you. 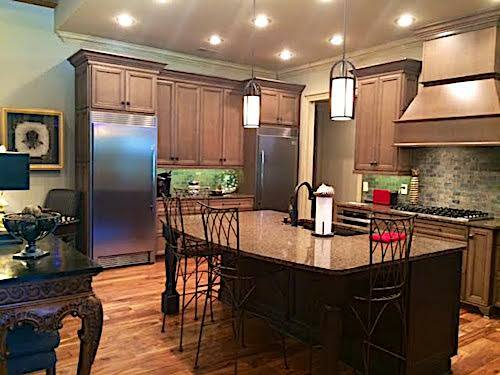 This 2,363-sq.-ft. transitional Craftsman style home's dark kitchen cabinets add warmth and depth to the space (House Plan #153-1786).